So, my Whole 30 (the elimination of grains, dairy, legumes, additives and added sugars for 30 days) has turned into a Whole 15. Yep, I am done. (No, I have not had a glass of wine yet, but it's on the horizon, woohoo!) So, why did I stop? I had a phenomenal run (after the first couple days of tummy aches). The sleep was amazing, I wasn't desperate for an afternoon coffee, and I was keeping up with our busy schedule and loving it. I never tired of the food - there were so many options and I was having fun playing chef. And then, Day 13 hit. Along with it came fatigue and bad symptoms. Kind of scary bad, but I'm a lady so I won't go into them here. The next day was the same. I was super conflicted - I did not want to quit. Max had to listen to my internal struggle: I'm not a quitter! I gave birth to our son - without drugs! I can do hard things! And sweet Max finally pointed out that there's a difference between quitting and walking away from something that's bad for you. In this case, I'm pretty certain it was the program that was the cause of my symptoms (though I really don't know for sure). I referred to my books, and they did say weeks two and three could bring side effects, and they advised to ride them out for a couple more weeks... um, which would cover the entirety of the program. I thought back to the original reasons I started the program, and the main one was to feel my best - the program was now doing the opposite, so for me, it was time to go. There's the obvious - phenomenally deep sleep, extra energy - feeling "light" (this was my favorite). But it's also really eye opening as to what you are putting in your body. I'm much more aware of ingredients now (after having to read every single can, package and box for two weeks) and alert to the extra added sugar in so many things. It opened me up for a new way of thinking and eating, and it stretched my cooking creativity. Similar to when I did my juice cleanse, it gave me a newfound appreciation for all the foods that were off limits. 2. You'll be swimming in dishes. One of the comments I heard most from Whole 30ers was about the food prep. They said they were prepping and cooking all. The. Time. And this is true - I don't think I've ever cooked so much in my life. But what everyone somehow leaves out is the mess and the dishes that come along with Whole30ing. Y'all, the program needs to be called Whole Dishes. Think breakfast - a bowl of cereal topped with fruit would have dirtied one bowl and one spoon for me pre-Whole30. Compare that to a veggie scramble with bacon, and eek! There are the knives, the cutting boards, the bowl to whisk the eggs (and the whisk), the frying pan, the spatula... and oh yes, the actual plate and fork. Dishes for days. And there are no off meals - each meal needs meat and veggies, each meal is a big production. I did get a better hold on things as the days went on, simply out of necessity because I was cooking all the time. I tried prepping veggies ahead of time (like cutting all onions, peppers and squash and housing them in the refrigerator to be used a bit at a time). Another time saver was cooking up a big batch of something, for example I boiled up a whole bag of baby red potatoes. All week, I grabbed them (now refrigerated and already cooked) for dishes - one day it was a big boiled egg and potato salad, then I crisped more up with peppers and onions for a breakfast hash, and finally served the rest with stew for dinner. There are short-cuts for sure, but for the most part, expect dishes. Lots of dishes. 3. You'll be desperate for a break from cooking. There's the obvious - no glass of wine while you're prepping dinner, no popcorn on movie night, no ice cream before bed. But the saddest part was socializing and dining out. So many social situations revolve around food and alcohol. Sipping cucumber water at a 40th birthday bash instead of enjoying a beer with everyone else? #sad Not wanting to dine out with your family because ordering a plain dry salad makes you feel silly? #sad And while husby was super, super supportive, I know he missed me baking (I did whip up a from-scratch cake for Father's Day, but I wasn't about to do any other for-fun baking when I couldn't even try a bite!). So, would I do it again? Possibly. To be honest, the "detoxing" was much, much easier as a juice cleanse. True, you don't get to eat on a juice cleanse. Boo. But, you spend infinitely less time prepping. Infinitely. Instead of shopping, you just pick up your juices, and instead of cooking you just pop them open. Easy peasy. Plus, juice cleanses are over in just a few days! However, I feel I didn't get the full Whole30 experience and thus all the benefits. I really enjoyed my time on it when it was good (before the bad), so I'll still keep it on my "maybe/perhaps" list to try again. 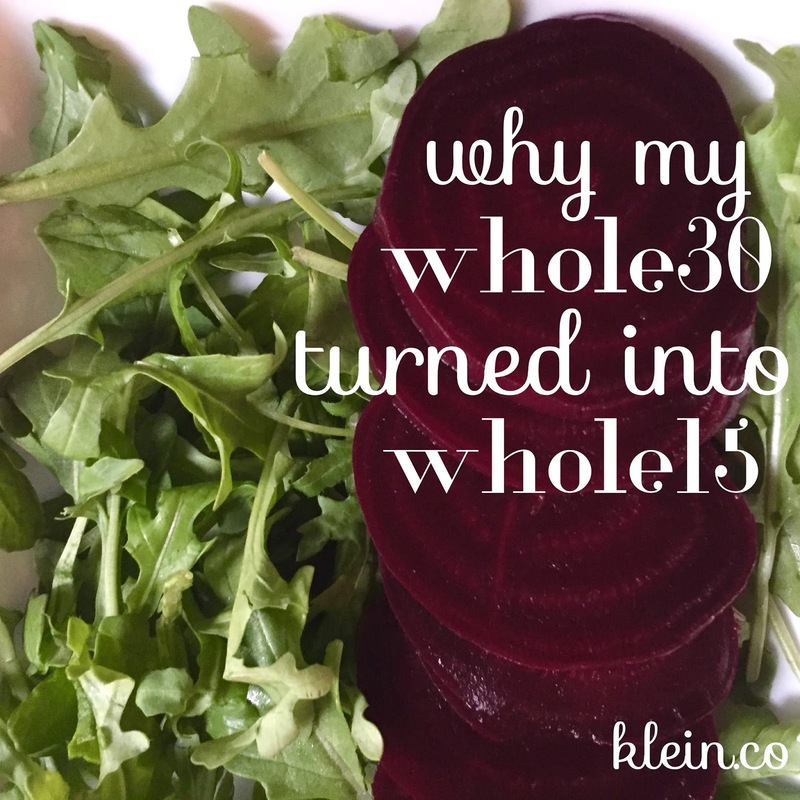 Are there any other Whole30ers out there? Did you complete the entire thing? I was waiting for this post....The "sad" part is what got to me....Life is too short for this. Thanks, again I am so gald I found your blog! You make my day when I get to my office drink my coffee and look around for the first 15 mins of my day and I see you and yours!! Cheers! Ugh, I've been wanting so badly to try Whole 30, but aaaall the cooking and aaaall the dishes and the no wine are the things that have made me not try it yet. So many good memories are created around good meals and good wine, and I just don't think I want to give that up! And I can't believe that you had some scary health issues because of it... that alone is making me not want to try it! oh man, i'm sorry about the bad symptoms, like you said, if you are doing it to feel good and you're not feeling good, there isn't much point! i don't really think the whole30 is for me, i really like (and rely on) beans and legumes, not to mention quinoa. i think trying to cut out all the other little things that you check labels for would be good, so maybe a modified one.. but i'm not giving up beans haha. Glad you gave it a try!! Sorry to hear it didn't work out for you. But I totally agree with the social aspect. It was very hard to eat out or go to events!! That was the worst part for me too. Thank you for sharing this experience!! It was eye opening for me. I don't know if I'd be able to keep up with the cooking and the dishes and the not feeling well at the halfway point. Yikes. I like your approach to just paying attention to what you're putting in your body. I wonder if I should just start there and not be so rigid with the Whole30 thing? !